“Thank you so much for the allergy and skin solutions! The Proaller, plus the Notatum alternating with the Quentans not only gave my 15 year old Maltese Beebop, relief from his respiratory and skin allergy symptoms---these amazing products helped his skin to heal completely and his beautiful hair to return so thickly, he looks like a young pup again. His ear inflammation and "gunk" cleared up and he's happy and frolicking like his "old self". 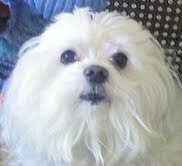 He's living up to that Beebop name and wrestling with our other two Maltese, Bambi and Thumper. For the first time in years, his little tail is back up and curled as he romps around our yard. We are eternally grateful to you and continue to recommend you and your products to all of our pet-owner friends and family." While humans often display respiratory symptoms such as sneezing and eye irritation from allergies, common symptoms of allergies in dogs and cats are excessive scratching, licking, chewing, rashes, hot spots, hair loss and even digestive upset. Generally, when a dog or cat is scratching excessively, the first thing we think of is that the pet has fleas. It is always a good idea to rule this out first by consulting your veterinarian or checking the pet’s coat with a flea comb for fleas. Once you are sure it is not a flea problem, more than likely your cat or dog may have some allergies. Allergies in dogs or cats can be caused by inhaled allergens (e.g. pollen), food (e.g. dairy, eggs, etc.) and/or external allergens (e.g. exposure to chemicals in carpet, etc.). One of the fastest ways to improve your pet’s health is to change your pet’s diet. Many dogs are allergic to certain meat proteins (beef and eggs are common) and common allergens such as corn, soy and wheat. If possible, the optimal diet for your pet is a homemade diet using easily digestible, low-allergen foods. Allergies in dogs and cats are a symptom rather than a cause in themselves. They often occur as a result of the long-term build-up of toxins and so the goal is to detoxify the body and enhance the immune system as well as to treat the overall allergy symptoms. An air purifier can be very helpful in reducing environmental allergies. Our natural anti-infection formula can be used topically to help heal hot spots. Sometimes allergy testing and desensitization is effective, although rarely 100% effective, in eliminating allergies in dogs and cats. 1)Allergies are cumulative. In other words, a pet may have both food and environmental allergies but the symptoms only become noticeable during certain times of the year. This doesn’t mean your pet doesn’t have allergic reactions all the time. It just means that the situation builds up similar to a balloon that fills up with air until it pops. In your pet’s case, it may mean that all of a sudden your pet has hot spots or starts chewing on its paws or rear end during the hot summer months but most likely has underlying digestive issues all year round. Is your pet "drawn" to the grass, showing signs of needing to get to the grass such as whining or pulling toward it? 2) Cats and dogs may display allergy symptoms differently. Cats may have respiratory symptoms, vomiting and other digestive disorders due to allergies as well as skin reactions. Dogs may have scratching, itching, chewing on fur, ear infections, scooting on their rear end and weepy eyes. Special hypoallergenic diet—Keep the following ingredients out of your pet’s diet. There is no “one” allergy diet that works for everyone. Each pet is different. 1) Consult your veterinarian to ensure endocrine disorders (e.g. hypothyroidism or Cushing's Disease), fleas, parasites and other health problems can be ruled out. Getting a veterinary exam is always a smart first-step as sometimes what might appear to be a minor sore, can turn out to be skin cancer once biopsied. 2) Change your pet’s diet to a hypoallergenic, grain-free diet. Do not use foods that contain chemicals, byproducts or additives that are hard to digest. Avoid key allergens that contribute to inflammation, indigestion and food allergies. 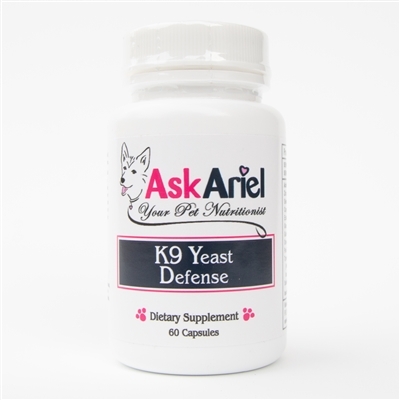 On the Ask Ariel order form at checkout, if you provide your pet's diet, our Nutritionist will include FREE diet tips on the packing slip with your order.